Mike Ullery | Daily Call Upper Valley Career Center senior Braeden Snider, left, a Landscape Management student from Troy High School, talks about his part in the construction of the latest project home built by career center students. With Snider are Rebecca Osborne who is part of the HVAC program, Keegan Webb from the Carpentry Program, and Corey Werst from the Electrical Trades program. Osborne is from Russia High School, and both Webb and Werst attend Troy. PIQUA — Upper Valley Career Center completed its most recent project house and is preparing to auction it off later this month. The project house is located at 8950 Looney Road in Piqua, and the public auction will be held at 10 a.m. Saturday, Jan. 26. There is a certified appraisal of the property in the amount of $180,000. “We’ve been doing this since the mid-’70s,” Director of Operations Patrick Gibson said. He estimated that there around 25 homes in the Piqua area that UVCC students have worked on to gain experience in their respective fields. On average, it takes approximately the length of a school year to complete a project house, Gibson said. 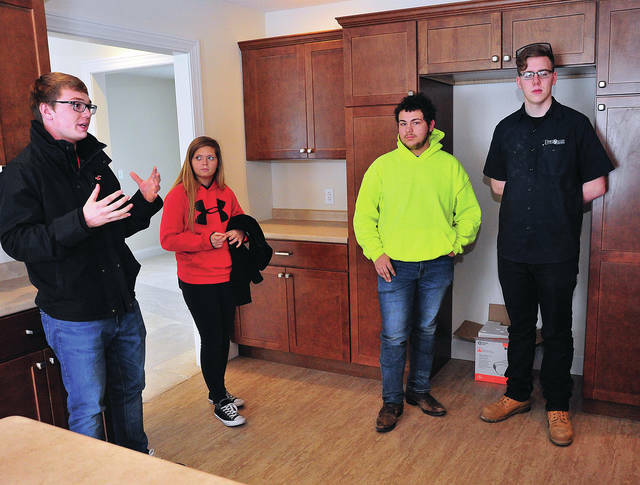 These project homes provide students with “hands-on, real-world work experience in their field of study that can’t be simulated in a classroom setting,” a press release from UVCC said. Each home utilizes the skills of multiple career tech programs from the school. This most recent home was a joint effort of the Carpentry, HVAC/R, Electrical Trades, and Landscape Management programs. Through those four programs, approximately a total of 60-70 students have worked on this recent project house. Braeden Snider, a senior from Troy who is in UVCC’s Landscape Management program, helped work on the landscape design, then helped implement that design at the project house. Snider said that they chose plants for the property that could last through Ohio’s seasons as well as act as low-maintenance design features. “We have to find plants that can survive in the climate,” said Snider, who also has an apprenticeship with UVCC doing landscape maintenance. Rebecca Osborne, a senior from Russia, represented the HVAC systems program. She did not work on that project house herself, but said that if she had, she would have worked on the ductwork and water heater for the home. Osborne also has an apprenticeship with Emerson in Sidney through UVCC. Corey Werst, a senior from Troy in the Electrical Trades program, said that he worked on running electrical wires from the panels to the outlets. “We did some of the drywall, some of the borders, and a little bit of the flooring,” said Keegan Webb, senior from Troy in the Carpentry program. Webb also has an apprenticeship with Millmark Construction in Troy. Gibson added that the program also offers students “a true sense of pride” with seeing these project homes come to fruition. “It’s pretty cool for us to see the end result,” Snider said. “It’s satisfying to know you made something permanent,” Werst said. The project house is 1,710 square feet. It is a ranch-style home with three bedrooms and two bathrooms. There is a living room, formal dining area, and kitchen and dinette combination. The large master bedroom comes with a walk-in closet. The home is on all city utilities with a natural gas furnace with central air and a natural gas water heater. There are also two covered porches. Gibson said that this latest project house is one of six on Looney Road on which UVCC students have worked. The funds from the sale of the purchase will go back into UVCC’s patronage fund, which began when a donor, Paul Duke, gave funds to the school to allow them to buy property and begin building these project homes. That fund goes toward future UVCC projects and project homes. An open house is scheduled for Saturday, Jan. 19, from 1-2:30 p.m. for anyone interested in touring the home prior to the auction on Jan. 26. Inquiries regarding the home can be made to Gibson at 381-1479 or gibsonp@uppervalleycc.org. https://www.dailycall.com/wp-content/uploads/sites/30/2019/01/web1_011719mju_uvcc_projecthouse1.jpgMike Ullery | Daily Call Upper Valley Career Center senior Braeden Snider, left, a Landscape Management student from Troy High School, talks about his part in the construction of the latest project home built by career center students. With Snider are Rebecca Osborne who is part of the HVAC program, Keegan Webb from the Carpentry Program, and Corey Werst from the Electrical Trades program. Osborne is from Russia High School, and both Webb and Werst attend Troy.